I hope everyone is having a blessed Christmas season. As is my ritual, once a year, in December, I put together a list of the photographs which I think are the best. Some may be personal favorites and some may be both personal and favorites of those following my blog and social media outlets. After each image, I will write a blurb explaining the image, and why I picked it as one of the best of the year. The images are ordered starting with what image I think is the best. I also wanted to say that I think this is a great exercise for us all to do once a year to grow as photographers. By the end of the year, you will know how you have progressed by doing this simple and fun exercise. This image was a finalist in the "Outdoor Galore" photo contest. 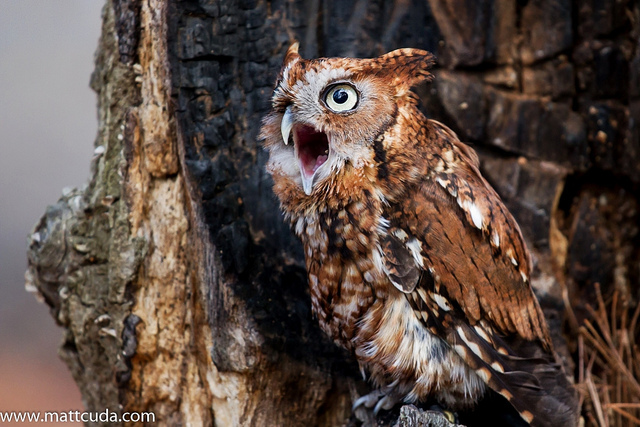 Number two has to go to this screech owl. I labeled this image "The Call", but honestly he is doing a bit of vocalization combined with working on his breakfast. I like this image from a behavior perspective as it gives the viewer a more intimate view of an owl that is normally only seen and heard during the evening and early morning. The burned out tree behind it is the perfect background for this beautiful bird. There is also a subtle gradient in the far background as the morning light of the forest illuminates a portion of said forest. This image will also be published in the January 2016 edition of Wildlife Magazine. 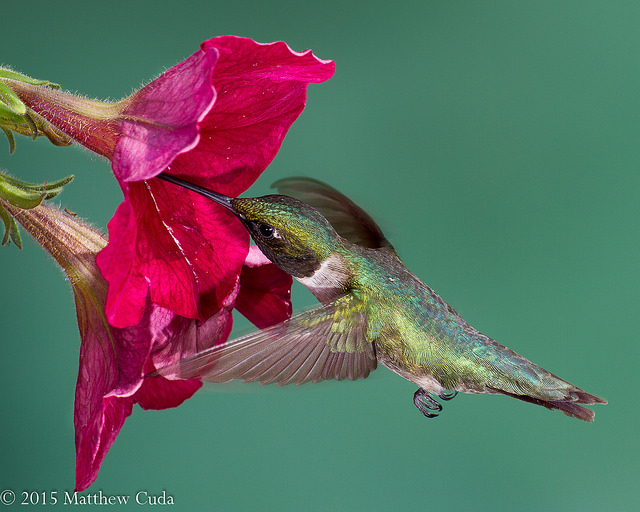 Coming in at number three is this shot of a ruby-throated hummingbird lapping up nectar from a petunia. There are several reasons I like this shot. First, I like the composition of having the two petunia flowers offset by the single bird. This forms a triangle of leading lines. Next, I think the green background accentuates the bright green iridescent feathers of the bird and contrasts nicely with the red flowers. Next, I like the fact that I was able to freeze the wings using a high speed flash technique while leaving just a slight ghost to suggest movement. Finally, come one, who doesn't like a hummingbird! I really have no idea why this is not popular among the public, but this image is one of my favorites from the year so I have positioned it at number four. First, this image just screams springtime! The beautiful pink peach blossoms, set against the earthy background fill me with the joy of this time of the year. 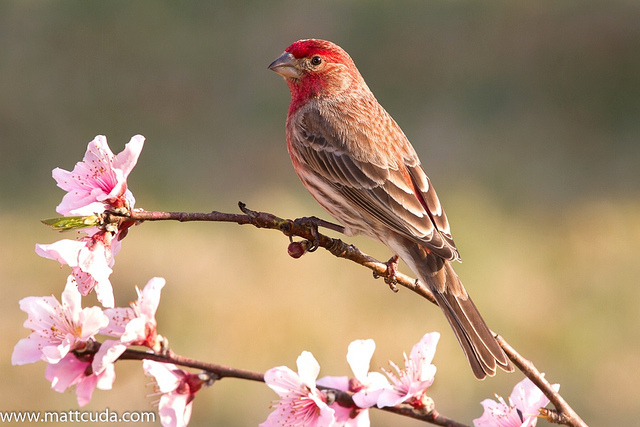 Next, this house finch is a beautiful male in full breeding plumage, and his feather color and detail are accentuated by the brilliant afternoon sun coming in from the right. Finally, from a technical perspective, I love the sharpness of this image, contrast and the beautiful bokeh. 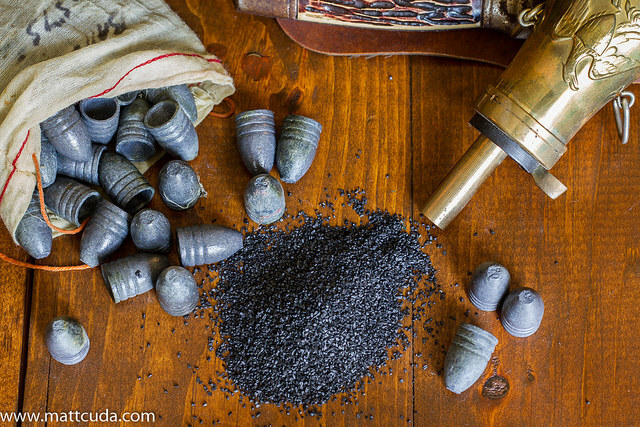 Number five goes to a still life I created early last year called "Powder and Lead." First, I like this image because it speaks to a rustic time long ago in American history. The old pine table is the perfect backdrop, and could have easily been a table found in a high ranking Union officer's tent during the Civil War. Finally, I like the positioning of the elements in the photo, which gives the composition a nice balance. The eye is taken in a large circle, starting in the top left, and ending in the round pile of gunpowder in the center. 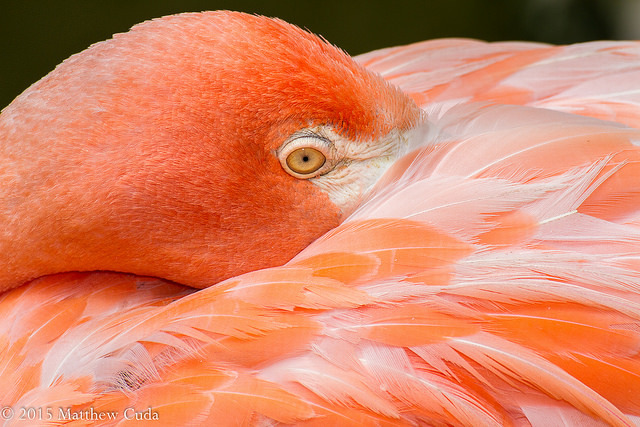 Number six goes to this amazing example of an American flamingo. First, I love the bright orange feathers which frame the focal point of the image: the bird's eye. 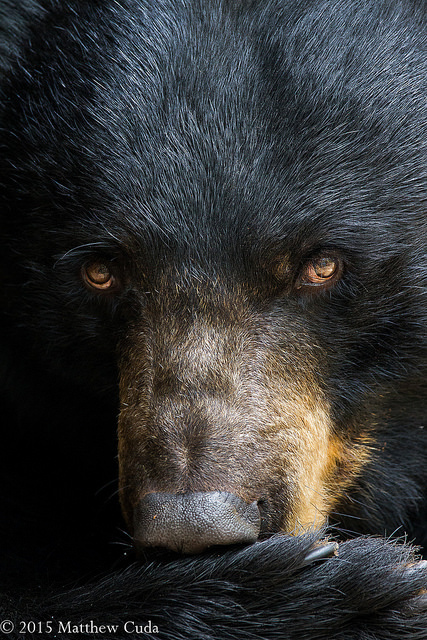 Images like this which have great impact and and intimate look into the animal's personality are rapidly becoming part of my style as a photographer. Finally, I like that there is just so much detail to absorb here. Look at the fine detail in the feathers, and the eye. This is the type of view that only a camera can produce. On to number seven which is an image of a tri-colored heron who is not very happy that another heron has invaded his hunting ground. Here, he is flashing his wings to and making aggressive movements to let the other heron know he is unhappy. Right away I am drawn to this image by the somewhat odd, but interesting composition. The bird's left wing is at a very high angle and provides a beautiful look at his wing feathers. I think I also like this shot because it is has a lot of action and tension. Viewers like to see animals in action rather than a subject just standing in one place. 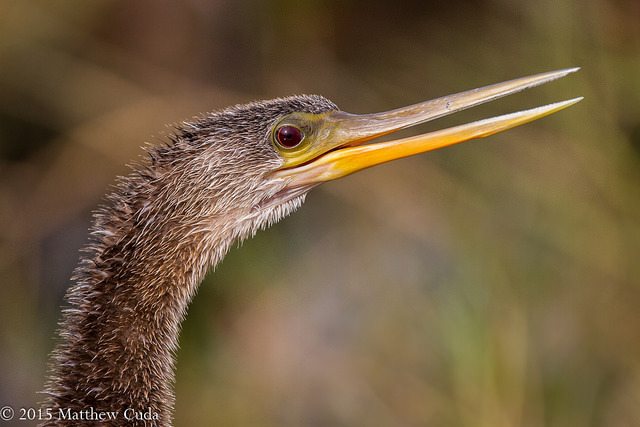 Number eight is a portrait I recently took of an anhinga while in Florida. I like this shot because it has impact. The bird's eye is intense, his bill is lifted and he is vocalizing. That combined with a simple background make this a winning shot, in my opinion. Finally I like the detail produced by the lens. When you are taking a tight portrait, it helps to have good glass. Again this type of image is really becoming part of my style as a wildlife photographer. Get close and get impact! This stylistic approach is in sharp contrast to photographers like Moose Peterson who tend to shoot more environmental portraits. One of the hallmarks of becoming a better photographer is being able to photograph the mundane in a new way. 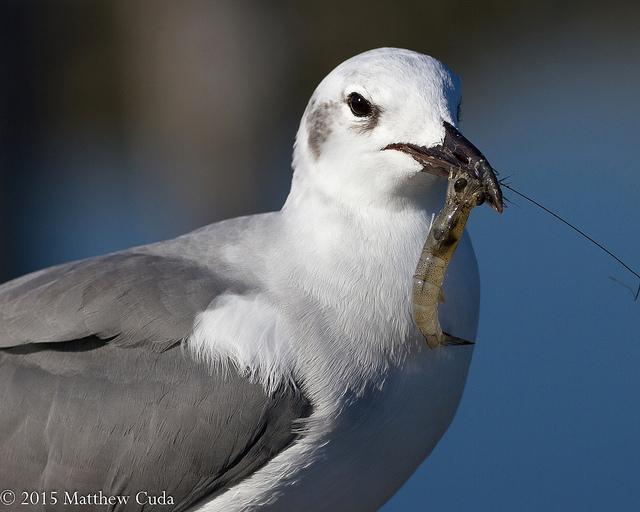 I think I have done that here with this image of this laughing gull eating a shrimp from the nearby salt marsh. First, I think this image has impact by showing a tight portrait of this gull, but more than that, I think the element which makes it unusually is this perfectly focused shrimp hanging from the gull's bill. Finally, I like that the image has a nice, smooth gradient background. The gradient is caused by the water and a row of brown grass along the water's edge. 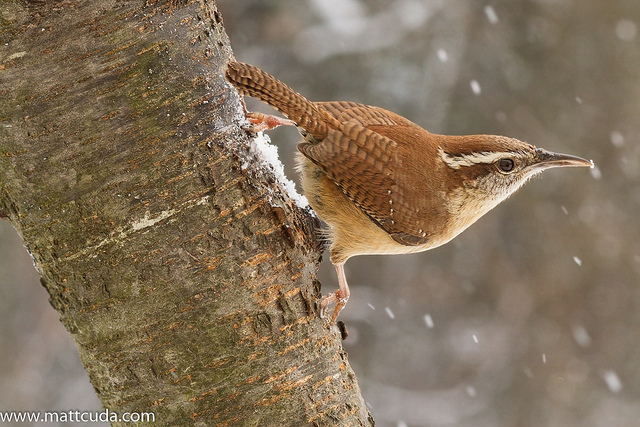 Finally, at number ten, we have the Carolina Wren in Snow. Honestly, this could just has easily been in fourth place as it could tenth, but I knew it had to be on my list, and I thought it would be good to round it out as we head into the winter. I like this shot because first, it is a snowy winter image. The snow provides a nice soothing element to the photograph, and if you look closely you will see the wren has a snowflake in his beak. Finally, I like the way the ash tree and the bird provide complementary leading lines. I really like the angles produced here. What a great November to celebrate! From a nature photography perspective I was able to photograph some of the most beautiful wading birds God has put on this earth. From a family perspective, it was nice to spend Thanksgiving with my family and eat until I couldn't move (as is my tradition). 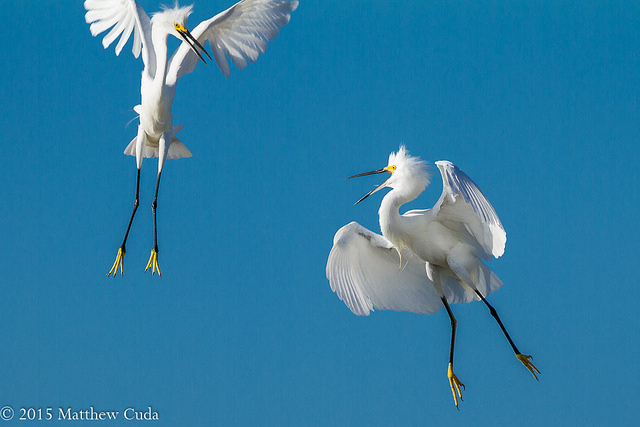 I am also pleased to announce the release of The Matt Cuda Nature and Wildlife Photography Podcast. Find out more about it at the end of the newsletter. In this newsletter I want to primarily focus on my trip to Merritt Island, Florida and in particular a place called Blackpoint Widllife Drive located on the island. 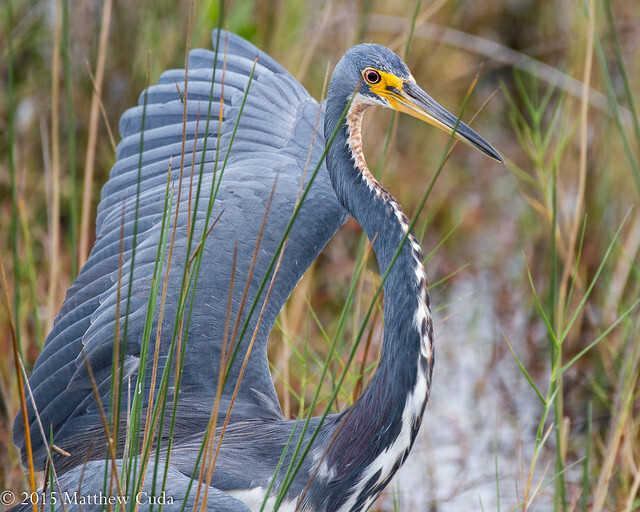 If you are an active birder or wildlife photographer then you have probably been to Florida once, or most likely, many times in your pursuit of finding the birds on your life list. And I can bet, that on your bucket list is a place called Merritt Island, Florida. If it isn't on your list then by the end of this blog post, I think it will be. Merritt Island is a fairly large island just off the east coast of Florida which was originally purchased by NASA in 1962 as part of the Kennedy Space Center. Because much of the land could not be developed by NASA for anything useful, it was contracted to the US Fish and Wildlife department to become a wildlife refuge in 1963. There are many opportunities on Merrit for excellent birding, but many of us in western society are always being sucked into time constraints we can seemingly do nothing about. Whether we are in Florida on business or there on a trip with the family, often, we do not have time to see all a park has to offer. The national park service recognized this and carved out a section of the island called Blackpoint Wildlife Drive. Blackpoint is a 7 mile, one way road, which snakes through large areas of salt marsh and open black water. During the drive you will see many species of birds as well as other animals such as the american alligator and rarely, otters and bobcats. Upon entering the drive, you will see a gate, and just beyond the gate is an area where you will need to pull off, put your five dollars in an envelope, and drop it into the envelope container. Once you do this, you can drive the route all day long if you wish. Additional seasonal passes can be purchased from the visitors center. As I began my drive through the park, I was stunned by the shear volume of birds present during the beginning of the winter migration. The American white ibis was prevalent in the park and I noticed them shifting their hunting locations from an area at the beginning of the drive to an area near the end of the drive and back again. 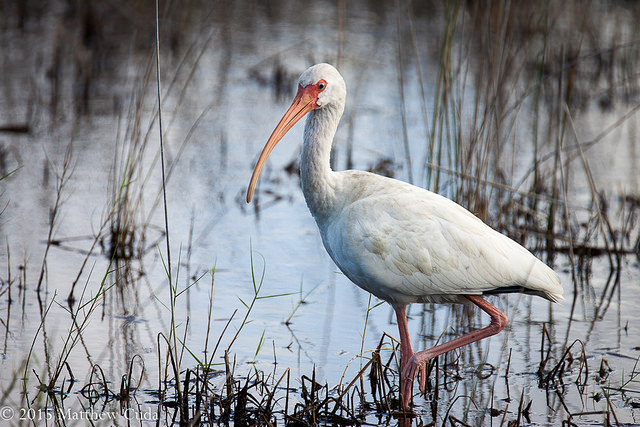 Below is an image of a white ibis hunting the marsh. Not surprisingly, the various species of herons were also present on the drive. Below, a tri-colored heron is showing his dislike of another tri-colored heron who has intruded on his hunting ground. Continuing along the road, there was a sharp 90 degree bend which takes you along a very large open water area and up in the corner of this area I found a large group of various species gathered one morning. During this time, it seemed that the birds were very energetic and a bit on edge. 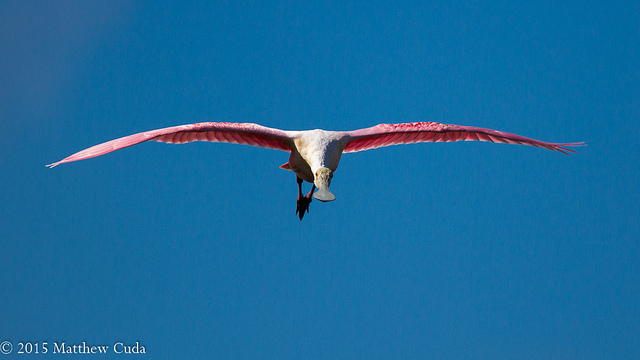 Here I captured a shot of two egrets fighting, another in flight , and one roseate spoonbill in flight. In this area and really throughout the drive, you can also see anhinga perched and drying out there wings after a hunt. Anhingas are also referred to as snake birds because when they swim, only their heads are seen above water. This is due to them not having oil in their feathers to keep their bodies afloat. Because of this, they must dry their wings every time they get done swimming. 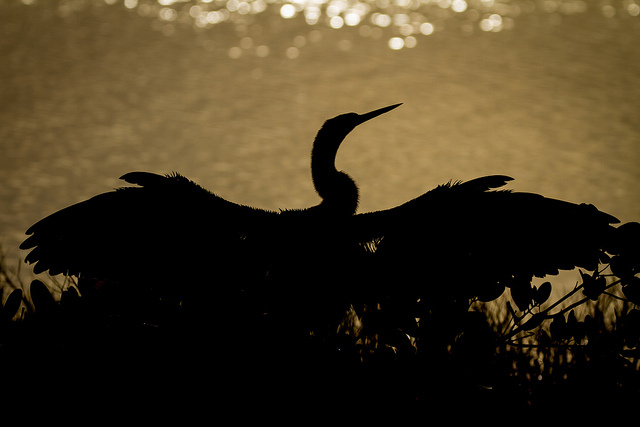 Below are shots I took of the anhingas. About half way through the park is an area you can pull off and walk a trail/water control dyke which you can walk and view waterfowl and ospreys. During December, I am told this is a prime location for wintering ducks, but during mid November it was quite unproductive. There were a few grebes here and an egret or two, but nothing to really get excited over. As I was nearing the end of the drive, I did see a hawk and plenty of kingfishers, but both species were quite wild and fearful of me and my vehicle. The bottom line is that if you have very little time to visit the Merritt Island area, then make the Blackpoint Wildlife Drive a priority. I guarantee you will not be disappointed. I also wanted to make you aware of a new podcast I have launched which specifically addresses wildlife photography. It is pretty rough right now as I fine tune technical aspects of the productions. I am starting out with a series on how to get into this genre of photography. It dawned on me today that I have never written a blog entry on what equipment I have in my bag, how I pack, and how I prepare for a shoot. So, I guess there is no better time than now. I believe the most important component to preparing for the trip is in location preparation. For my trip to Florida, I first checked out the internet, via our friend "Google", for information regarding birding in Florida. This would include topics such as "winter birding locations", temperature and what kinds of species I might encounter. After the basic searching, I will then narrow my search by looking for hot spots already discovered by fellow birders and photographers. For example, searching on "Florida Birds Arthur Morris" turns up a myriad of locations since Art is a well known and published bird photographer. Once I find a location where I think I will have the best chances of cranking out some great images, I will then use mapping software to see how long it will take to drive it or fly it and what kind of obstacles I might encounter. For example, in Florida there are both toll roads and costs to get into parks. I wouldn't want to get caught without the cash to even get into the national or local park. If I am going to a national park I will often go onto YouTube and see if anyone has shot video of the area so I can get a better feel for how the terrain and lighting will look. As I get closer to the trip I will do one more check of the weather. I am specifically looking for sun direction, wind speed and wind direction. Why do I do this? First, the direction of the sun is crucial to better wildlife images. When the sun is low and coming in over your shoulder it produces a soft, golden light, directly onto your subject. 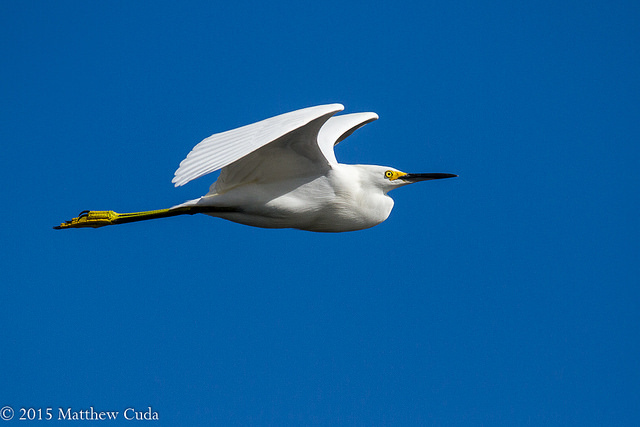 Next, wind speed and specifically direction is important to determine which way a bird will take off and land. Birds always take off and land into the wind and often they will stand into the wind as well to avoid getting their feathers ruffled. Sigma 150-600mm Contemporary - This is a light, sharp, super telephoto zoom. This thing is the real deal, and very important for staying out of the fight or flight zone of wildlife and creating better bokeh. Canon 50mm 1.8 II (sharp, cheap and versatile) - I use this with extension tubes for macro work. Canon 10-18mm IS - I use this as my primary landscape lens. I am NOT in love with this lens but it does the job with some decent post production work. If you can afford something better don't buy it. Kenko PRO 300 DG 1.4x TC - This teleconverter, when attached to my 600 gives me an effective length of 1300mm !! Beware you will get some image degradation. This is normal with TCs. Cheap wireless shutter release - you can pick this Chinese made shutter releases on Amazon all day long but it works quite well. Tiffen Polarizer Filter and Step Rings - I use the polarizer when I am shooting waterfalls to remove the glare on the rocks. I consider this filter essential. Opteka Autofocus Extension Tube Set - A cheap extension tube set, but they get the job done when I need to shoot macro with my 50mm. Manfratto 3221 Tripod - I can't say enough great things about this tripod. It is no longer made, but has served me since the mid-1990s. Bogen 3030 Pan Tilt Head - A great all purpose tripod head which can even be used as a poor man's gimble head in a pinch. This item is no longer made, but can be found on the used market. Grizzly Camera Bean Bag - I can use this bean bag as a saddle over my car door and rest my long telephotos on it for great support. It can also be used on the ground. 3 LP-E6 Batteries - Even shooting heavily I can get through an entire day of shooting with these batteries. 2 MP-E3 Batteries - These are use for my Canon 1D Mark II. 4 Compact Flash Cards - used primarily in my 7D. UDMA 7 are the best version for the 7D. 4 SD Cards - I only use these in my 1D Mark II along with a backup CF card. Emergency Blanket - A light and small item which might help save your life if trapped in the car or in the woods. Small LED Flashlight - Great for finding the settings on the camera in the dark and checking out the trail. Hunting Knife - The knife can be used for protection, but I have it in case I get lost or need to cut something in the field. Note that I have two bags. One bag I put all my backup gear in, and one backpack I actually wear on my shoulders. I leave the backup gear in the car. Both my bags are sprayed with camp dry to keep them waterproof. Make sure you take your gear out of the bag before spaying the silicone and let it dry thoroughly. Plan your arrival time based on your research conducted during the preparation phase of the trip. For example, you want to shoot in the best lighting for animals and this is not usually in the middle of the day. Don't roll out of bed a 10:00 am and expect to get great shots during the heat of the day. Get up before dawn and be at your location no later than daybreak. If this is a location you have never been to before, realize that it will take some time to get acclimated and find the animals. If possible stop by the park ranger's office to find out where the wildlife currently is and what species are plentiful. You might burn up a couple crucial hours of shooting, but the time could pay off for you in better shots that evening. Finally, and above all, be patient. If you can't sit still and wait on your subject, then wildlife photography is not for you. It can take hours to get only one good shot! I hope this was helpful for you when planning your next wildlife shoot. So now get out there, have fun and shoot!